Can The Use of Technologies Deliver (And Help Pay For) Big Infrastructure? Accepting the premise that financial constraints impose burdens upon public policy choices allows the wicked problem of infrastructure improvements to be addressed by technologies. Dealing with the cost of infrastructure can now no longer be the exclusive purview of accounting. Enter the dawn of a new age of opportunity. The opportunity takes the shape of shared revenue through future cash flows emanating from infrastructure. More specifically, in the cases of both consumers of infrastructure as well as the providers or guarantors of the underlying infrastructure itself — the public (and increasingly private) sector participants’ claims on infrastructure improvements’ resultant cash flow. Neither the public sector nor the private sector have pockets deep enough to solely finance or pay for the four trillion dollar invoice. The well-known scholar Paul Samuelson’s 1938 Revealed Preference Theory attempted to bridge (no infrastructure pun intended) the lack of understanding consumer preferences among bundles of goods, given budget or financial constraints. At that time and place, Samuelson proposed the Revealed Preference theory as an alternative to Utility Theory. For example, in South Florida, do I want to take Interstate-95 (a federally funded transportation infrastructure service) and not pay or do I want to take the Florida Turnpike (a state provided and funded infrastructure service) and pay instead? Does the probability exist that taxpayers domiciled in Montana might feel more of a connection knowing, in addition, to already partially subsidizing Interstate 95 in the State of Florida, they are also contributing to increasing productivity, lowering costs, pragmatically promoting environmental sustainability and extending infrastructure life cycles through adoption and application of 14 technologies? And vice versa? Embedded in the definitions of the 14 sets of technologies may be the bridge between resolving the infrastructure burden and resolving the financial burden. In this third installment of the four-part series on technologies delivering impact and value for infrastructure, I am providing a brief summary of the suite of technologies may reveal such a bridge. The bridge, in this case, may be tied to the average age of a lifecycle. After reviewing and highlighting the various infrastructure sectors in the prior two installments of this series, the average age of big infrastructure is estimated to range from 40-70+ years. The average age for a generation of high-technology ranges from 18-21 months. The classic textbook definition for technology generation comprises initial product launch through completion including the introduction, growth, maturity, decline and, ultimately, termination phases. Information and Communications Technologies listed in Table 1 below are considered “high-tech” and, oftentimes, virtual as opposed to the second set of Physical Technologies and their perception of “low-tech.” Notwithstanding the foregoing, both sets of technologies seamlessly work together. The impact of virtual technologies combined with the physical technologies listed above serves as a starting point for additional research regarding the degree of impact. For example, high-tech devices and systems work in conjunction with low-tech such as surface technologies enabling roads, to better “adjust” to environmental conditions. The Internet of Things (IoT) is a comprehensive system that simply connects one device to any other device. According to a 2015 study conducted by the Institute of Electrical and Electronics Engineers, the use of IoT in infrastructure projects is becoming commonplace. Incorporating the use of sensors, location-based services and automated two-way communications, as well as cloud storage, and the use of autonomous monitoring devices such as drones and unmanned vehicles, the use of each generation of IoT has extended the lifecycle of infrastructure by 10 years on average. 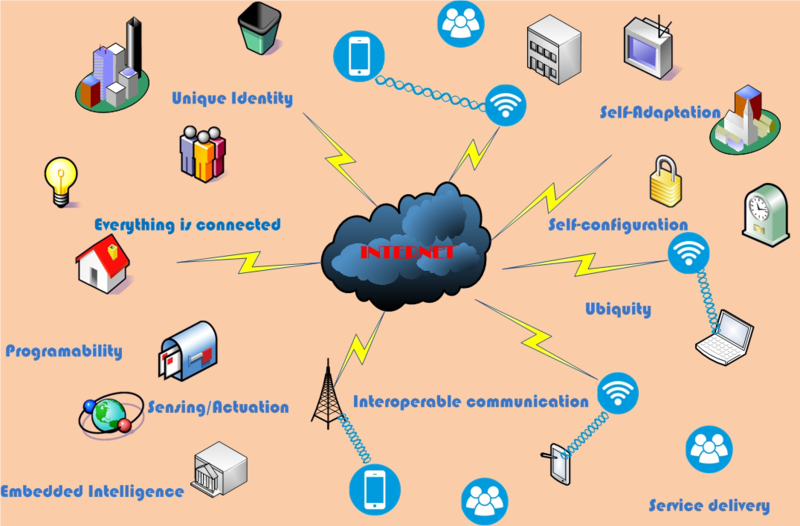 As depicted in Figure 1 below, IoT products “include devices, software applications, and services such as smart phones, tablets, intelligent networks, big data analytics, and cloud storage.” Simultaneously, IoT sensors and other devices are used to monitor conditions ranging from weather to structural integrity for big infrastructure projects. Furthermore, the IEEE also points out that IoT may deliver additional impact and value through organizational, value chain, supply chain and social improvements such as “democratization and control” of infrastructure. The final article in this four-part series will provide the results of a quantitative analysis assessing the impact of the 14 technologies upon productivity; subsequently serving as the independent variable and costs, EEOPL and environmental serving as dependent variables. Maybe such progressive solutions such as affixing infrastructure with a certain environmental status, such as greenfield or brownfield or sustainability and resilience classifications can assist in mitigating (if not eliminating) costs, while simultaneously providing a pathway for new financing mechanisms. Additionally, solutions may reveal themselves such as block granting infrastructure improvement projects based on the four factors, enhanced lifecycles with economic value-added or heretofore unqualified infrastructure now available for financeable upgrades. Our perception that infrastructure is utilitarian may be incorrect. Maybe the ultimate impact and best value for money technology delivers allows infrastructure to serve as a vehicle for innovation and entrepreneurship. The proverbial unbridgeable chasm between wicked problems and financial solutions may afford technologies the marquee status they deserve.